I am grateful to you all (wherever you are) for subscribing and reading these words. There is always something and someone to be grateful for, even on the hardest of days. Every few minutes, life throws something at us that we don’t want – traffic, dirty dishes, a gray hair, a screaming child, a work project, bills, divorce, death. These situations bring up uncomfortable feelings – frustration, sadness, anger, fear, vulnerability. Our natural, automatic reaction is to push the feelings away. When we carry resistance beyond this initial reaction, we are saying no to life. We are refusing to feel our feelings. It can become a way of being. We resist in all sorts of ways - eating, drinking, shopping, texting, blaming, worrying, yelling. We endlessly scroll through Facebook or Instagram. We think this should not be happening. We stay busy. We try to perfect what is in our control. This resistance takes energy. It builds tension in our bodies. It strips us of the present moment. When we avoid feelings, fear unconsciously drives our behavior. We organize our lives to avoid feeling difficult emotions. It’s so normal yet so unhelpful. The next time you struggle with an unpleasant emotion, instead of pushing the feeling away, lean into it. This involves going into your body and noticing what the emotion feels like physically. As much as you want to turn away from this feeling, get to know it. Learn as much as you can about it. Use adjectives to describe the feeling in great detail- its color, shape, movement, texture, location, temperature. Acceptance and Commitment therapists recommend that we observe our feelings as if we are curious scientists, then open up and allow the feelings to be there, even if we don’t like them. The point of feeling our emotions is not to suffer for the sake of suffering. By dropping the struggle and opening up to a feeling, we reduce its impact on our actions. Instead of putting our energy into resistance, we invest our energy in doing what makes our lives meaningful. We gain peace and presence. To say yes is to be in your life completely, with all of its richness and complexity and messiness. In the words of Jon Kabat Zinn, “you put out the welcome mat” on your life. There is beauty in a willingness to be with whatever arises. Notice the feelings in your body, make room for them, allow them to hang out while you carry on and do what matters. Would you like to learn more about processing difficult feelings? Let’s talk. A joy, a depression, a meanness, some momentary awareness come as an unexpected visitor. How Do You Take Care of Yourself While You Care for Others? Are you taking care of others in a way that depletes you or leaves you empty? In that case, it’s easy to become critical and resentful of loved ones. Any need or request becomes a burden and further drain on our own energy and resources, a trigger for painful thoughts, a threat to our own well-being. I’m working on an article about how to take care of your own well-being even when you care for others. What would you like to explore about this? How do you keep a healthy relationship to yourself? Maura Captain is a life coach, certified by Martha Beck Inc., who loves to help people use relationship challenges as a gateway to growth. Her coaching provides time and guidance to lift the hood and understand the programming and routines that run the show. With this insight, you can take action to manage your emotions and change your behavior to disrupt unhelpful patterns (even if people in your life don’t change). Are you wrestling with a problem? Would you like to see that it's really a chance to reach levels of joy and satisfaction you've never experienced before? 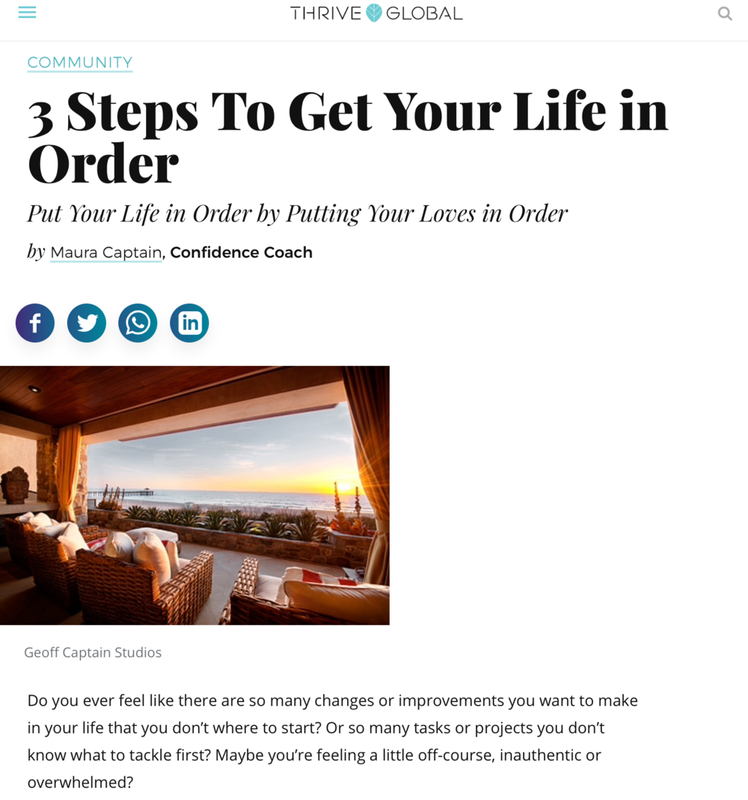 3 Steps To Get Your Life in Order is now live on Thrive Global! Tired or Overwhelmed? Try This. Do you notice what your mind says upon waking in the morning? (Then it calculates the number of hours before I can sleep again and runs through all of the tasks in between). Sigh. But let’s go back to: I AM TIRED! Joel Olsteen points out the power of “I am:” Whatever follows “I am” will determine your experience. You are inviting it into your life. This gives you some space from the thought so that it doesn’t take over your whole person. ‘I’m having the thought that I’m tired.” Even more space: I notice that I’m having the thought that I’m tired. :” It takes a bit of the sting out the thought, right? Compare yourself to those around you. Even better: Compare your insides to everyone’s outsides. Best: Compare your insides to everyone’s social media outsides. Proceed to despair. Ignore your truth, pretend, and please everyone. Make sure you hide your flaws and insecurities and wrap yourself in a pretty package so that you will be acceptable and belong. Blame others for what you are feeling and for what’s not going right in your life. In this effort to transfer the pain you are feeling onto someone else, you hand over your power to take action to change things for the better. Hold grudges. Do not forgive. Treat others kindly and respectfully only if they treat you in such ways. Believe your mind when it tells you that you are not enough - not good enough, thin enough, rich enough, smart enough, certain enough, safe enough. Listen to your ego when it tells you that you are what you have, what you do, and what other people think of you. Avoid discomfort by not doing hard things, even if they are important to you. Don’t ask for help. Believe that asking for help makes you weak and not enough (see # 6). Believe that you are the only one who thinks, feel, or does the above. I keep my copy on my nightstand and always feel better after reading. I am giving away a copy of The Wisdom of Sundays: Life Changing Insights from Super Soul Conversations! Sign-up for my newsletter if you haven’t already. Send this link to one friend who may be interested in managing her mind and improving her life. Suggest that your friend subscribe. Send me an e-mail to let me know (or just copy me on your forwarded e-mail) by Tuesday, October 23rd. I will enter your name in a random drawing to take place on October 24th. Ready to uncover some thoughts that are getting in the way? And learn tools to handle those thoughts? I have a special coaching offer on October 16th only- $75 for one 50-minute coaching session (regularly $107) over the phone. It’s one day only and spaces are limited. Take a look at remaining spots here on my scheduling page. The worst case scenario is definitely going to happen. You can’t handle it anyway. In other words, that thing you worry about, the worst, is inevitable. And when it happens, you won’t be able to cope. You’re not tough enough, capable, smart, or strong enough to handle it. The problem with these lies? They keep us from doing (scary) things that are important. When we believe these lies, we keep our lives small. What if you believed, that no matter what happened, you could handle it? You could do your best and that would be enough? You would probably take more action toward things that are important. Or maybe you would just relax a little more. You can gather evidence to dispute the lies. You can take yourself through the worst-case scenario. I have a fear that when my husband is gone overnight, someone will break into my house and do terrible things to my kids an me. Not fun to think about, right? It makes it hard to sleep, which makes it hard to do anything else. Years ago, my brilliant life coach helped me with this. Now she could have just helped me gather evidence as to why this worst case scenario was very unlikely to happen (where we live, dog, lights, statistics, living through many nights…), which was helpful. This calmed my mind but my mind could still argue the possibility. So my coach also walked me through the worst case scenario. . Where would someone break in, where would I be, where would the kids and dog be, how would I get to them and get out…so I ended up with a plan. I felt empowered. This coaching session was many years ago and I still think about it because it was so powerful. The worst was unlikely to happen. But even if the worst happened (and I am not denying that the worst would be awful), I could handle it. I saw through the lies of anxiety. I sleep much better these days. I hope you do too. Would you like to talk about how to let go of the lies? I have a special coaching day this Tuesday, October 16th. Lately I have had the desire to do much clearing of clutter. A certain degree of this is normal for me. I love the words “organize” and “clear.” The Container Store is exciting to me and I follow interior designers on Instagram just for the opportunity to view beautiful spaces. I also have a friend who sends me photos of cabinets and rooms she has de-cluttered and we proceed to exchange enthusiastic emojis. There is much information out there on how to organize your physical space. But what about your mental space? You need an organized mind so that you can have an organized life. Organization involves classifying items or arranging them into categories. We have tens of thousands of thoughts per day so let’s get to know them. Let’s start by taking a look at the categories of thoughts. Past- What stories does your mind tell you about the past? What does it say about past failures or mistakes? What does it regret? Future - What are your worries about the future? What is on your to-do list? What are your plans? Why does it help to describe your thoughts? Because the better you get to know your mind, the better you can manage it. If you can stand back and watch your mind, you’re not caught up in the thoughts swirling around. You can catch your mind in the act. “Ah ha, I hear you mind and you’re throwing out all of sorts of reasons why this isn’t going to work/get better/change. I see what you’re up to.” You can notice the thoughts that are not helping you be who you want to be, do what you want to do or produce desired results in your life. You can then use strategies (another post or a coaching session) to get some space from those thoughts so they have less impact on you. Would you like some help downloading the thoughts swirling around in your head? Schedule a coaching session to start de-cluttering your mind. Session #1: Identifying how your life would be different if you had more confidence and pinpointing which of the five main causes of low self-confidence may apply to you in a particular area. Session #2: Practicing tools to detach from thoughts that sabotage your confidence and clarifying the person you want to be, what matters most. Session #3: Handling fear and anxiety so they have less impact on you. Each session is 50 minutes over the phone with an individual client. Topics may vary depending on individual need. The content is designed to help you develop genuine confidence to perform better in your work & relationships. How to start? Schedule 3 sessions using my online calendar and I will be in touch. “Your approach to confidence is very innovative and groundbreaking/paradigm-shifting." Do you ever feel like there are so many changes or improvements you want to make in your life that you don’t where to start? Or so many tasks or projects you don’t know what to tackle first? Maybe you’re feeling a little off-course, inauthentic or overwhelmed? You can put your life in order by putting your loves in order. This concept of putting “loves in order” comes from St. Augustine. Our lives turn upside down and lack meaning when our loves are out of order. If I gossip about a friend at a party, I am putting my love of popularity or approval above my love of friendship or loyalty. If I consistently avoid my workout routine, I am putting my love of comfort over my love of health. This is a tough one: If I constantly criticize my spouse’s parenting, I may be putting my love of parenting above my marriage. Is that ultimately what’s best for my kids? How often do we value being right (and feeding our egos) over uncovering the truth (and strengthening a relationship) in an argument? Lack of meaning, discontent, unhappiness and disorder stem from acting out of line with values. But when I think I need to do everything, I feel overwhelmed and paralyzed and don’t do anything. Remind yourself that taking small steps will show your mind that progress is possible and give you momentum to keep going. Even with all the things undone or unchanged, you are still okay, worthy, lovable. It is worth sitting down and figuring out what is most important and putting your time, attention and energy there. Turn to page 16 in my Blueprint for 2018 to guide you. Note adjectives and verbs in the life areas that apply to you. Rank values in order of importance. Notice what is very important and in need of your attention to make your life workable and meaningful. Looking at the greatest discrepancies between how important a value is and how effectively you’re living by it, what is the next right move? To be more at ease with yourself? To make earth look a little more like heaven? To be more of the person you want to be and reach your goals? If the next right action is spoken, what might you say in the next opportunity? If the next right action is something you can schedule, put it in your calendar. If a relationship is in need of your time and attention, can you schedule a time to be present and engaged with that person? Then do the next right thing. You can even budget your time across priorities the way I budget my money (I use a program called You Need a Budget in case you’re wondering): Take the time you have and first schedule what is most important. Then, with additional time, what is next in order of priority? You may wonder what beliefs are driving you to put your loves out of order or leading you to self-sabotage (hint: they may worries about what other people think or unhelpful beliefs about yourself). Get to know your thoughts and triggers and let go of unproductive habits and automatic reactions in 2 coaching sessions. Schedule here. ...so that we can be the people/partners/parents we want to be. I'm here to guide you through these life skills and help un-do the unhelpful messages you've picked up along the way. If you're not living the life you want, let's talk about it. Interested in e-mail coaching? Let me know. I have described my youngest daughter as the most confident person I know. Even as a baby, she would smile as she entered a room as if she could comprehend that everyone already loved her. Then, around age 5, something changed. Molly started refusing to wear certain clothes. Anything “cute” was out of the question; it had to be “cool.” When I would ask her about the reasons for her clothing choices, she would actually refer to other kids’ thoughts, opinions, comments. This did make me sad. It’s one thing to wear what you really love, another to dress worried about what others will think. My husband and I wonder if Molly’s self-consciousness has to do with getting so much attention and so many “You’re so cute" comments early on. She seems to want to avoid such attention now and may be too smart to be blissfully unaware. Maybe it’s just part of growing up. But sometimes, it gets in the way. What does it mean to be self-conscious? Wikipedia defines self-consciousness as a heightened sense of self-awareness. It seems to be an intense focus on oneself, either on inner thoughts and feelings or as one is viewed by others. We focus on what other people think of us. We know ourselves better than anyone else and we know exactly where we fall short of ideal. Combine this with egocentrism - our tendency to view the world from our own perspective - and no wonder we think everyone else is focused on our flaws. This is normal but not helpful if it keeps us from doing what is important. Self-consciousness can make us think twice about running into the grocery store on a bad hair day (or is that just me?). Remind yourself of a phenomenon called the “spotlight effect.” Thomas Gilovich, PhD, and colleagues coined this term after conducting studies including one in which college students were asked to wear an “embarrassing” t-shirt (of Barry Manilow) and enter a room where others participants were sitting. The students wearing the embarrassing t-shirts were asked to estimate the number of people who noticed the t-shirt. The students wearing the t-shirts overestimated the number of others who noticed (they guessed about 50 percent would notice, but only about 25 percent noticed!). So remind yourself that the spotlight effect leads you to overestimate the amount of attention you’re actually getting. Watch your mind as it assumes knowledge of what everyone else is thinking of you. Notice your mind when it tells you what’s wrong with you, where you fall short, that you can’t dance, sing, write, speak and that everyone is going to see this if you dare do such things. Just notice the words going through your head. When you’re watching your mind, you’re not in it. Most people do not do this. Work on accepting everything about yourself and your life. Fully. Sounds like a lot to ask, right? It’s from a place of acceptance that we do great things. So, in full knowledge of your weaknesses and awareness of your thoughts and feelings, stand tall with shoulders back and do what you need to do to make your life workable and meaningful. Want to explore this a little more? Let’s talk. In the past few months, I have a become a big fan of podcasts. I would venture to add podcasts to my "What's Saving My Life" list (more on that list this summer after my "What's Saving My Life" party). This past week in particular, I listened to MANY podcasts. My husband took our three daughters camping for a few days and podcasts provided company, entertainment and education while I cleaned and organized (but not while I worked of course). Podcasts are my go-to audio for workouts and solo drives. I would love to hear about your favorite podcasts (e-mail me or comment below). Here are a few of mine in no particular order. Happier with Gretchen Rubin - Author Gretchen Rubin discusses happiness and good habits with her sister Liz Craft. Happier in Hollywood - Liz Craft (Gretchen Rubin's sister), a TV writer and producer and her writing partner Sarah Fain talk about how to be happier and healthier in a crazy, chaotic, superficial world. It's light and funny and fascinating to hear about working in Hollywood. Selfie - Bloggers Sarah James and Kristen Howerton talk about self care and all sorts of random (often hilarious) topics. Good Life Project - Jonathan Fields has conversations with some of my favorite authors, writers and speakers about "living a fully-engaged, fiercely-connected and purpose-drenched life." Who doesn't want that? The Simple Show - Tsh Oxenreider has conversations with co-hosts about breaking down big ideas and saying "yes" to the right things. Oprah's SuperSoul Conversations - If you haven't watched or listened to these shows, they are life changing. Online Marketing Made Easy with Amy Porterfield - For online entrepreneurs, Amy provides a wealth of helpful information on extending your reach and growing your business.